July | 2014 | Lamb on a bike! I’m not a natural runner, nor am I blessed with any motivation to get better at it without a tangible goal in front of me, so I signed up for a half marathon, to force myself to get out and do some training (then I didn’t do any training). My brother kindly volunteered his services as my pacemaker and on Sunday morning we headed to Windsor for the start of the Down Tow Up Flow Half Marathon, running along the tow path to Marlow. I felt nervous at the start so I was glad to get moving, and pleased that the day was slightly overcast and true to the forecast of “cooler than of late”. Of course this forecast was a pack of lies and by a few miles in it was boiling. By 8 miles in I’d had one gel, drunk 2 cups of water and poured another 3 cups over my head and 1 (accidentally) down my front. I felt very sick and eventually thought I would actually be sick, so we stopped at some bushes. A beetle took the opportunity to land on my leg and bit me, drawing blood. Exactly what I needed! I swatted it away but it bit my other leg. I felt slightly less sick so we carried on. My lack of training was apparent and I felt absolutely knackered. Chris kept telling me to lift my head up as I cut a forlorn figure when I’m tired, and I tried to concentrate on matching my steps to his. I’d also noticed that my right hand had gone funny and as well as feeling quite numb it looked a lot like a claw, like it did after my accident last year. 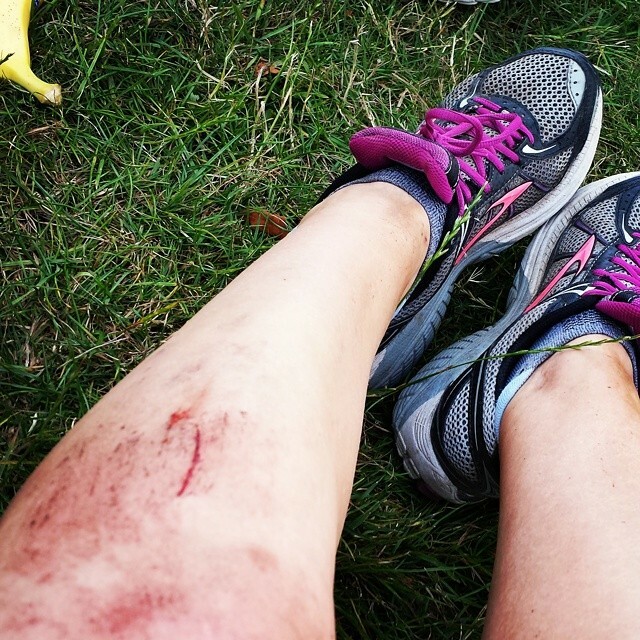 It’s never done this before – I wonder if it was the heat, lack of fluids, hatred of running? 11 miles in and I felt ruined. I kept trying to walk and acted like a petulant teenager when Chris encouraged me to keep going. There was no shade at all and I was hot, tired, worried about my claw hand, trying to remember to keep my head up and to stop thinking about the pain in my hip. We ran along a gravel path, between some white picket fences. Suddenly I felt myself falling, I’d tripped on something. I fell for seconds, minutes, hours: a Matrix of time trapped inside one movement. I landed on my hands and left leg, but my hands seemed only a bit bruised and my leg, once I’d picked the larger bits of gravel out, was okay. Chris helped me up and we ran to the water station conveniently located ahead, where he threw cups of water over me. I’d really wanted to beat my half marathon PB and when I realised that I wouldn’t the final bit of motivation left me, even a field of cows with a tiny calf didn’t cheer me up much. 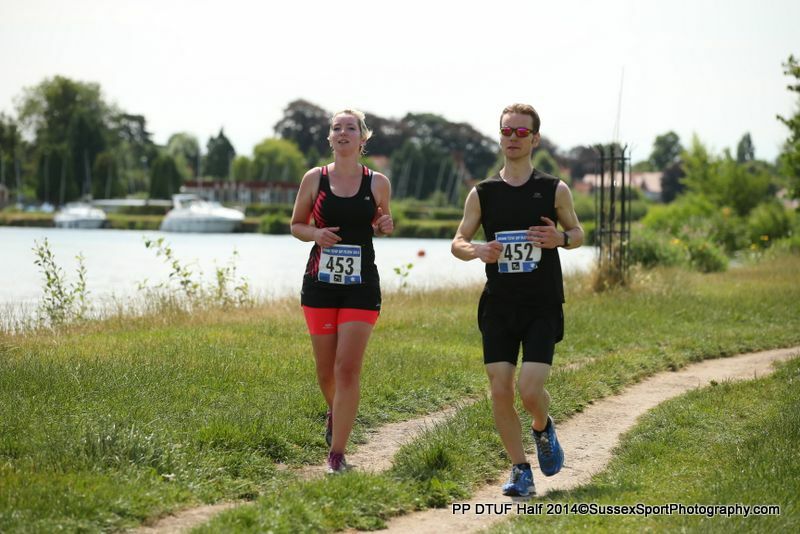 We passed a sign saying 500 metres to go and Chris kept encouraging me (I, personally, would have pushed me in the river and run off) and I felt like the course would never end. 13 mile mark – and suddenly the end was right there. We ran, we crossed the line, we smiled, the medics picked all the rest of the bits of gravel out of my leg and then we went to get an ice cream. I’ve been thinking a lot about the psychology of racing, or simply participating in sport. It won’t come as any surprise to anyone who knows me to hear that I’m a perfectionist. I set myself goals that I want to hit (for example, I want a sub-2 hour half marathon time) but then I don’t train properly for it, because part of me believes that I won’t be able to do it anyway. By not training enough I give myself an “excuse” not to have achieved the goal, rather than not hitting the goal because of some other, deeper failing of mine. This is, as you can imagine, hugely unhelpful and damaging to my self-esteem, as I constantly feel disappointed and frustrated. If I tell myself I don’t care (and then don’t train/prepare), I run the risk of not doing well and then feel annoyed with myself for letting myself down. If I do care, I become paralysed by the enormity of the situation and become convinced that I can’t do it – which, of course, means that I then can’t. Friends tell me they’re proud of my achievements, but I can’t think of a single sporting achievement that I’m genuinely proud of (except perhaps getting a Merit in Grade 8 Ballet, because that was so ridiculously against the odds and took so much hard work). It’s taking that first step. Believing you can do something, then working towards it, and dealing with the fallout of what happens if you don’t quite make it. Written down, that sounds so simple. Like a moth with a light bulb, I keep throwing myself into futile situations where I can only expect to see the same old outcomes. Friends say I’m brave for trying new things (marathon, cyclocross, track, triathlon) but being brave would be putting myself on the line and seeing whether I can really do it, not making a web of excuses for myself to fall back into when I lose my nerve once again. I cannot go on like this. A little while ago, I was bemoaning my lack of descending courage to a friend, who suggested I give cyclocross a go. What? Ride around in mud, slipping and sliding all over the place? That sounds hellish, so probably very good for me. British Cycling were running a development session ahead of the Summer Series, so I signed up, pleased to see that they would provide bikes for women and juniors, presumably to get more people into cyclocross. I don’t own a CX bike and was thinking I’d have to borrow one from my housemate, who is about 7cm smaller than me, so this was good news. The development session was tough. It was at Herne Hill Velodrome, behind the track. I got on the bike, pointed the bike down a ramp, freaked out and grabbed the brakes (which produced a lot of noise but not much stopping), and continued to freak out for the entirety of the lap, with peak freak outs on any slppe (down or up), particularly the descent straight into a brick wall. It felt a bit like when I went snowboarding. Everyone else was merrily chucking themselves down slopes and having a blast, while I clung to the side and let my courage seep away. I got off my bike several times. I re-emerged at the start, where Jason the coach asked how I was getting on. I felt like crying. I felt like a massive girls blouse. Jason was super encouraging and suggested I give it another go. I’d been gearing myself to hand the bike back to him and leave but he seemed to think I could do it, or, at least, he was incredibly optimistic, so I carried on going. I got better, but starting from such a low base meant it wasn’t hard to see some improvements. At the end of the session, people were encouraging me to come to the Summer Series anyway. “Someone’s got to come last!” they said, as if this was an incentive. I did have to think about it but decided to do it, as part of my ongoing struggle to conquer my fears. Race 1 – my first cyclocross race! – was held at Bethlem Royal Hospital, which is a bit of a schlep from my work. I arrived, picked up my borrowed bike from Jason and swapped my pedals over. A really nice guy from LFGSS, who’d seen my abysmal first attempt at CX, had offered to take me on a sighter lap before the racing started, and after a quick pootle about on the grass to check out the bike, we set off. The course had a grass section (into the wind! ), then some woods, back onto the grass (tailwind, yay) and into some more woods before some plank jumping fun on the way to the finish line. My friend gave me some useful tips while we slogged along. Halfway round I thought to ask how a cyclocross race even works (40 minutes (or an hour) + a lap) and wondered if I’d make it through the whole thing, as I was already pretty knackered. I found some of the more technical stuff a bit daunting and was not looking forward to riding it while people (inevitably) lapped me. We got back to the start to see… NO ONE! The race had started without us!! “You can catch them up! !” we were told (LOL!) and so we pelted off, half a lap down before we’d even crossed the start line. My friend went off and I tried to relax. Weirdly, the things that had perturbed me on the sighter lap (a descent in the woods, a massive hole on a bend) didn’t matter so much. Actually, I thought, what’s the worst that can happen? I’m already last, I’ve already cut my knee (before I’d even got on the bike…), I’ve come all this way and I may as well give it a go. I don’t want to be the kind of person who quits. I’m not a quitter. Let’s do this. I’m not sure I’ve ever been so thirsty (why didn’t I bring any water with me?). I managed the scary descent, rode over every root and spun up every hill. I thought about quitting when my legs felt SO TIRED but remembered that I’m not a quitter and carried on. I got ridden into by a chap who shouted “on your left” just after he hit me. I got thanks and encouragement from the people lapping me and from the marshals. I actually had a really awesome time. I had no idea what time the race had started or how long it was going to be, so I just kept going until I heard the bell, signifying the last lap. And then I went another lap, thinking about water, thinking about my tired legs, thinking that I was having a pretty fun time, all in all. I crossed the finish line – two friends cheering me on just beyond it. What a relief. After drinking Neil’s water (water he told me afterwards he’d got from a random outside tap in the hospital grounds) and applauding the winners, I asked Jason if I’d come last. He told me that not everyone had finished, which made me feel pretty pleased with myself. The ride home was the slowest ever and I had to be talked into not just eating haribo for dinner when I got in (apparently that’s not real recovery food?? ), but today, thinking about the race, I smile to myself and think: well done hats, you did it. 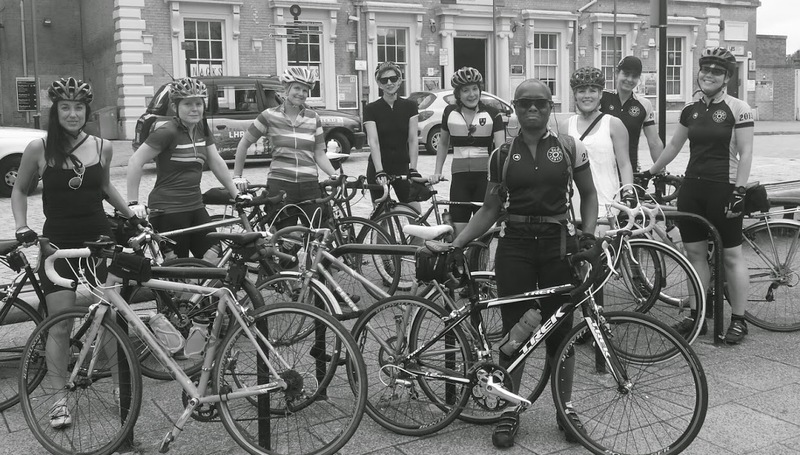 Leaving aside discussions about why women are only challenged to ride 100k and also Rapha’s use of men to lead the women’s ride last year, we – as in, some of the women from LFGSS – decided to organise another ride this year for the Rapha Women’s 100. Discussions for this took place on the way back from Windsor, a really enjoyable ride with lots of animals, good views and homemade vegan cakes. We felt that by stating from the off that this wouldn’t be a slow ride (some people seem to think women can only ride slowly and think that an LFGSS Ladies ride would be a good time for someone who’s not really ridden before to get involved – it’s not that we’re unfriendly, we’re just not a crèche), men wouldn’t be allowed (contentiously, for men who like to tell women what to do) and we would go to the seaside. 10 of us met at Greenwich station, at the start of a glorious day, heading for Whitstable. I was ostensibly leading the ride, as I had the route (indeed, I had planned the route) although I wasn’t feeling on fine form due to events the day before. 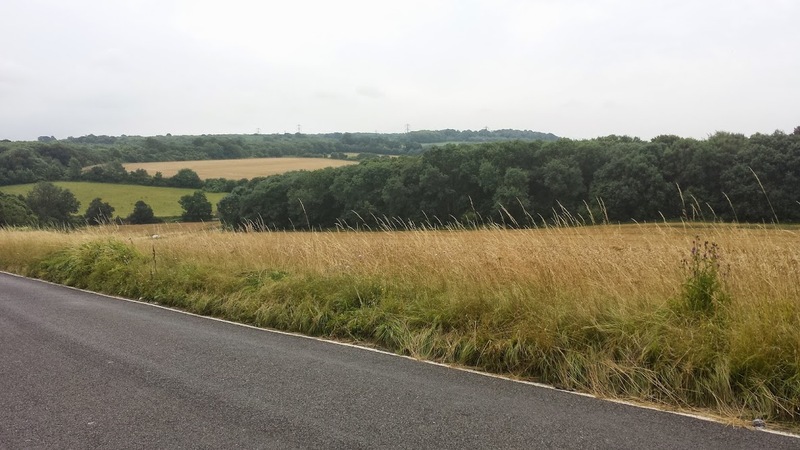 We set out through southeast London, eventually surfacing in the countryside outside Bexley. We were unable to detour to Dartford to visit the Mick Jagger Leisure Centre but instead were treated to some nice views and beautiful sun. With only a few wrong turns and a long drag up over the Medway Bridge, we stopped in Rochester for lunch at a café. Although we tried to keep the stop as short as possible it was hard to keep it much less than an hour, although it did give the 11th member of our group a chance to find us (she’d missed the start point). Rochester, the old bit at least, is nice and was about the halfway point, which is why I’d chosen it as a lunch point. Setting off again, there was plenty of Medway still to navigate and it was good to finally escape it and be hit by the smell of salt on the flats near Iwade. The air felt close and humid, we all felt sticky and thirsty. As we arrived in Sittingbourne the first rain fell. Almost immediately it picked up some weight and we looked for shelter while it blew over. Hiding under a large tree we watched the rain and listened to the thunderstorm, counting the seconds between the thunder and lightning (the storm was right on top of us). The tree didn’t stay a good shelter as it was quickly saturated. People with jackets put them on. I was wearing a sleeveless jersey and denim shorts, and had no jacket. We got cold. One girl left, for the station. By now it was extremely wet, the rain kept coming and the roads were waterlogged, with terrible visibility. Eventually we realised it wouldn’t stop and we had to move before we got any colder or wetter. I got on my bike and set off down the road, hardly able to see and letting water into my shoes. 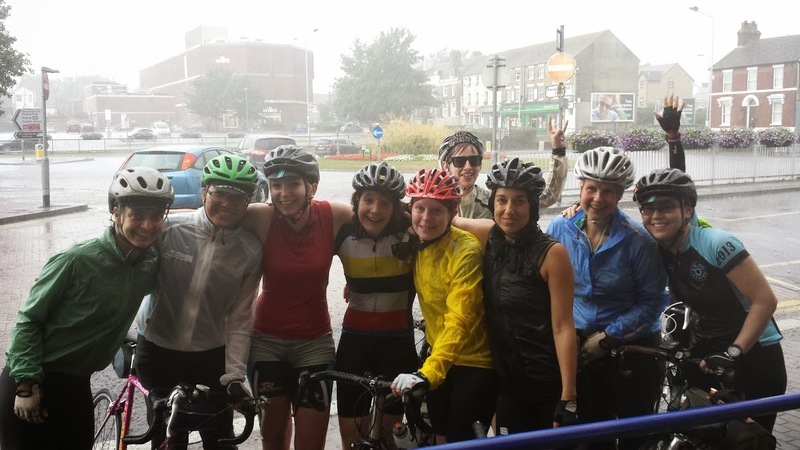 We stopped at a garage briefly to decide what to do – some people had been toying with the idea of carrying on to the seaside – but it was just so wet we all decided to go to the train station. The station was only a few minutes away but it was the sketchiest riding I’ve ever done. Flash flooding meant there were rivers of fast flowing water on the roads, wash from cars and overflowing drains. A downhill in central Sittingbourne ended in a foot of water. It was a case of hoping that there was nothing under the water, holding on and hoping for the best. We later found out that we’d ridden into a “major storm”. We arrived at the station, soaked. The thunder hadn’t stopped (and indeed didn’t until we were nearly back in London) and the lights in the station kept going out. But despite the cold, having to wring our gloves out, feeling like our feet would never dry out and not making it to Whitstable – despite all this, I had such a good day. Great company, nice pace, good laughs, gorgeous sunshine, comfortable on my bike and enjoying spending time with old friends and meeting new friends. I got home with a grin on my face and a warm feeling inside. Although I’d by no means call myself an expert in it, I know a small amount about bikes. But I am, controversially for some bike shops, a woman. And that means that interactions in bike shops can sometimes be rather infuriating. Bike Shop Assistant: How can I help? Me: I’m just after some SPD cleats. Me: Shimano SPD mountain bike cleats. BSA: I just need to check your bike. Me: No you don’t. Do you sell those cleats? BSA: You don’t have the right pedals on that bike! Those are road pedals, there are different types you know. Me: Yes thank you, that there is a road bike and the cleats are for a different bike. BSA: Are you sure you want mountain bike cleats? They look quite different. BSA: I’ll get the cleats. (awkward silence and then he points at my cap, which says Laurent Cycles, Paris) I like your hat, where is it from? There are a number of different events at this distance, but he wanted to do an Ironman-branded event, meaning race locations were limited. Ironman UK is held in Bolton and I’m not sure I’d be happy to put all that effort in only to end up back in Bolton. He chose the Austrian edition, in Klagenfurt, a town in Carinthia. I’d watched his Half Ironman (partly in my capacity as chauffeur) and when Chris told me about his plans for Austria I floated the idea of coming to watch this race. He didn’t seem opposed to the idea so I did what I always do when there’s a holiday to be planned and started a spreadsheet. Ryanair used to operate direct flights to Klagenfurt but these are no more, meaning a stopover. After fiddling about on kayak.co.uk for a while and staring at maps I decided that if I had to change planes then it may as well be somewhere good. I also discovered that accommodation in Klagenfurt was booked up and the only place to stay was the campsite – and figured that if I was going to camp there then I should camp everywhere. 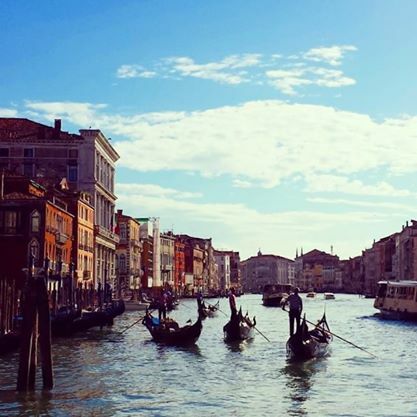 This is how I came to go camping… in Venice. After three days in Venice, I took the train through the Carinthian mountains to Klagenfurt. The scenery was off the scale: blue lakes, rugged rock faces and tiny mountain passes. 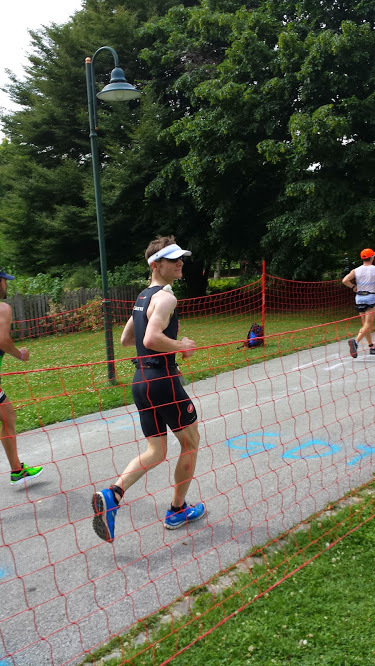 As we got closer to Klagenfurt the mountains calmed down and rounding the Worthersee itself it became clear that we were nearing triathlete territory, with at least 100 people out running and cycling along the lakeside path. The next morning, my brother came to the campsite to check on his bike – he’d had it brought to Austria by Race Force, who were super nice and unfailingly friendly. We went for coffee by the lake and chatted tactics, icecream and ducklings. 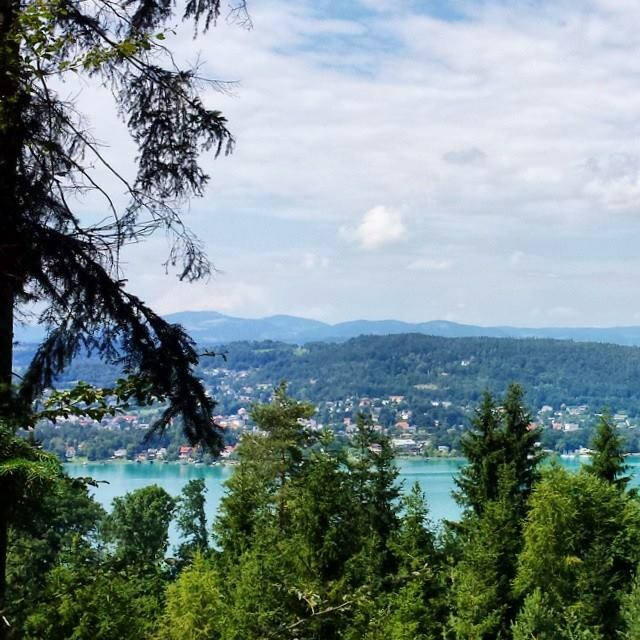 After a stroll around the Expo I headed for a hike around the south side of the Worthersee. I’d brought a hiking map and was pleased to have it. Trails are well marked in Austria but a map was still useful. I was also glad to have my hydration rucksack as I didn’t have to worry about carrying (or worse, running out of) water. The next day I ran to Krumpendorf, following the race route (feeling like a fraud), before doing some laundry and going to meet Chris for coffee. I went on another hike, this time on the north side of the lake, getting the train back from Portschach. I drank 2 litres of water, an iced coffee on the train and several non-alcoholic beers back at the campsite. Hot stuff! That evening I put the finishing touches to the banner I’d made for the next day and tried to sleep, thinking about how the competitors must be feeling. Race day. I woke up and fussed about in the tent for a while, not quite sure what to do. I had breakfast and decided to get up and go to the Strandbad. It was just before 6:30am and the place was packed. Competitors, some wet suited up, others unzipped, milled around. I had no idea where my brother might be and decided not to worry about it as there was no way of finding him and nothing to gain if I did find him. I pushed my way forward but couldn’t see the elites set off as there were still too many people in front of me. The competitors got into position, some posing for photos, and there were lots of announcements – including a prayer and the national anthem. 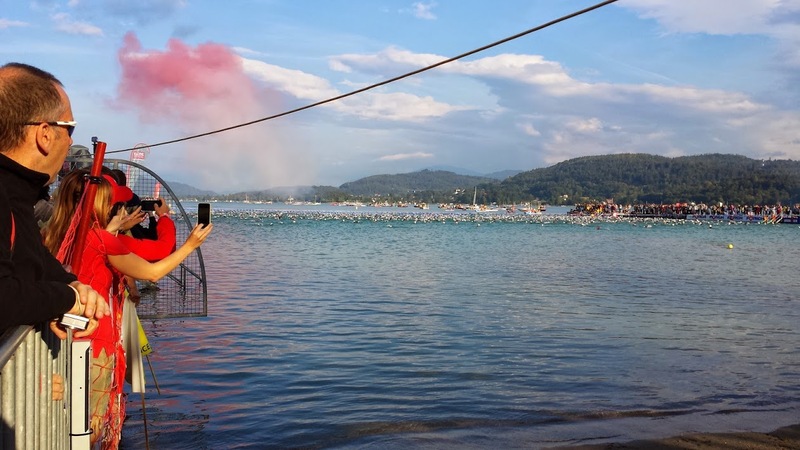 The gun went and the athletes started running for the water, and fireworks were set off. It’s funny to watch several thousand people swimming together, like a westsuited shoal. The swim course was mainly in the lake but the final 1km would be along the Lendcanal, so I went there. I found a spot by the footbridge, near a pair of sausage dogs, and sat down to wait for the first athletes. I couldn’t believe their speed! Someone behind me pointed out Faris Al-Sultan, a triathlon celebrity. It was very hard to tell anyone apart as everyone wore black wetsuits and swimming caps – the only difference was that the elites had colourful hats, the first wave had blue hats and everyone else had white hats. I saw a white hat overtake a blue hat and saw someone else try to swim into some steps. 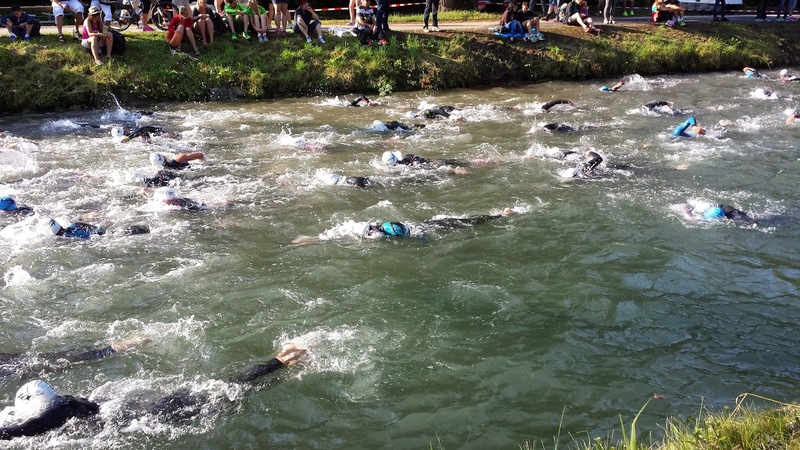 I gave up trying to spot my brother in this wetsuited mayhem and headed out onto the bike course, using the coaches laid on by the organisers. 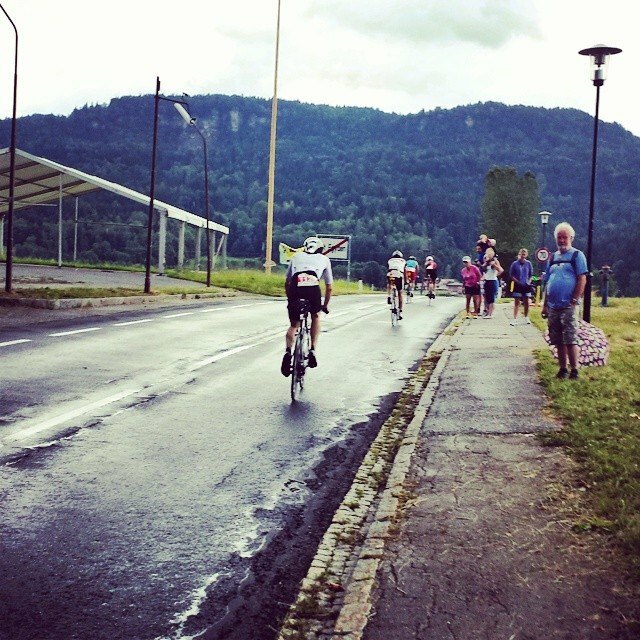 There was a choice of destinations: the two climbs on the course. I chose the second as I thought that would give me more time to get there, although it occurred to me that I’d told my brother I’d be at the first one. I had a snooze on the bus but woke up in time for our arrival in St Egyden, wandering up the road a little so I wasn’t too near the blaring sound system. As I cheered the riders coming past (getting a few high fives and grins) I started to worry that I wouldn’t see my brother. He wouldn’t be looking for me, I didn’t know what he was wearing and everyone was coming past so fast. I was concerned that I would miss him AGAIN and I wouldn’t have an idea of how he was doing. I had a rough idea of what time he’d be past given the finish time he was aiming for and knew he’d be making up time on the bike leg so might seem further back than he should be. I scanned the clothes, bikes, faces, helmets of everyone coming past. What if I hadn’t missed him and something terrible had happened? What if he came past at a time that meant he wouldn’t make his target time? Would not hitting the target be better than not finishing? Keep scanning. Stop panicking. The moment I saw him I knew it was him. He stared at me and I started jumping up and down, waving my “Iron Lamb” banner. He high fived me and continued up the hill and I grinned to myself for a full ten minutes. He was looking happy and focused and not remotely tired. There was about 2 hours before he’d be back on the next lap, so I went for a 10k run, where I got lost and accidentally ran into a river, looking at my map. I was back in place for lap 2, occasionally ducking for shelter during the rainstorms. This part of the course had a commentator and he pointed out some notable athletes, such as the youngest Austrian. By this point he must have been there for 4 hours and was running out of things to say, so he was shouting out the names of the riders coming past, as their race numbers had names and nationalities on them. Spanish riders got a hearty “olé!” and he’d started shouting “god save the queen!” at anyone British. This lap I spotted Chris at the bottom of the hill, just as the commentator saw him and shouted “god save the queen, Chris!” – and I could see Chris looking for me. I waved the banner for all I was worth and managed to get a few photos, before waving him off… and making a split second decision to chase after him for a bit, up the Rupertiberg (I didn’t last long). Feeling happy, I headed back to Klagenfurt. I dropped by the campsite to use the wifi and see how Chris was doing on the online tracker. I made a miscalculation both in terms of timing and the course logistics – the course (a figure-of-eight, twice) was mainly two directional, except for around the central bit where there were some one-way sections. I stood by a one-way section wondering why no one was going the other way for a few minutes before realising my mistake and tearing off in the other direction, managing to miss him entirely. Luckily I only had to wait another 10k for him to come back, so I had a picnic lunch and got the banner out again. I spotted him quickly – he was, helpfully, wearing a visor – and could see he was looking for me. He threw me his gel belt and I asked how he felt. “I feel great!” he said, and he looked it, as he ran off out of view. I looked behind and realised the course snaked round the corner, and that if I ran, I might make it over to him again. I sprinted across the park, hurdling children and small dogs, shouting Chris’ name like the terrible spectator that I am. 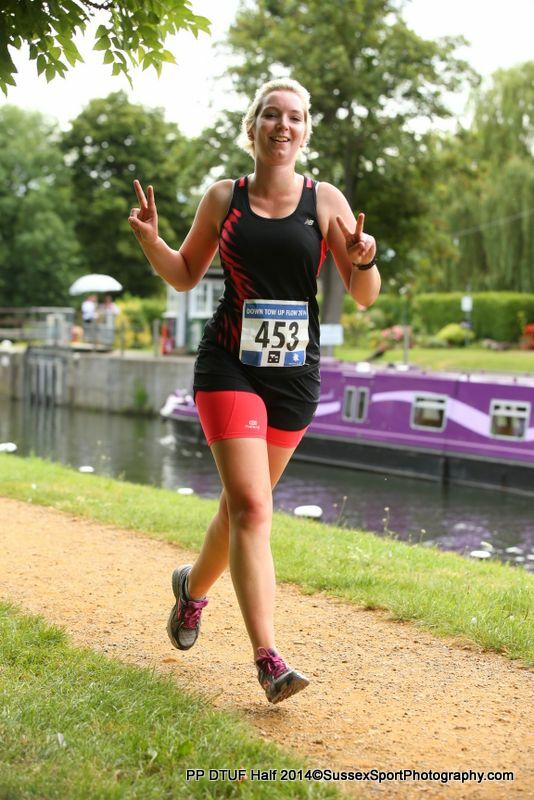 I snapped a couple of photos and went to get an icecream and to see some people finishing. Another 10k later, I positioned myself just after an aid station, feeling like I was in the wrong place and on the wrong side of the road. Smiles had been replaced with faces of grim determination and tiredness hung heavy in the air. Chris came past, not looking happy but not looking in any danger, no limping, gurning or crying – a vast improvement on many people I saw (myself included) at the London Marathon. After some deliberation I went to the finish line. It was emotional: some athletes looked triumphant, others looked destroyed. One stopped at the top of the ramp and proposed to his girlfriend. A couple of people ran in with their children before that was banned (harshly, the ban was imposed when one little boy was half way to the finish). I kept checking the online timings. There was a checkpoint at 40km and another at 41km, and I’d worked out when he needed to be at both in order to hit his target. He crossed 40km. I stopped checking the timings and stood on the barriers to get a better view. 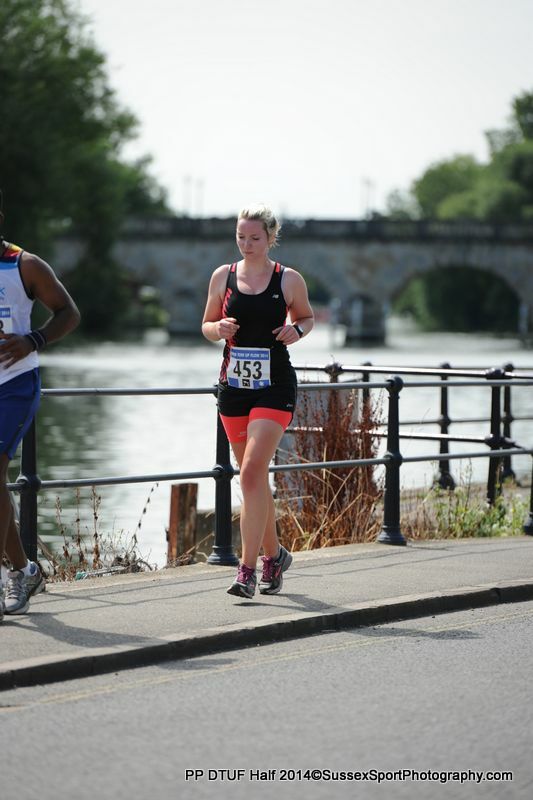 I saw his white visor bobbing along the lakeside path as he headed towards the finish and I started filming. He turned the corner, raised both arms and ran to the finish, crossing the line in 10:56:20. I burst into tears and ran through the crowds and the Expo to the finishers area. Chris had become easier to spot as the day progressed, as I instantly spotted him lying on a pile of wood chip. I called his name and he pulled himself slowly to his feet and came over. He looked exhausted but happy and relieved. I gave him a hug through the fence and he went to find a foil blanket and to see where the medics were, as he was feeling unwell. The finishers area had a Weissbier stall and he grabbed two glasses of that, one for him and one for me, and we walked to the Irondome to be nearer the medics. 15 minutes later Chris came out of the Irondome looking refreshed, holding a donut and another Weissbier! We spent the evening hanging out with the Race Force crew and watching the final competitors. 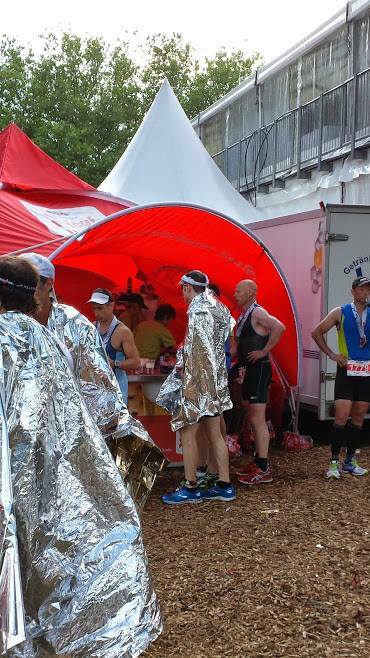 Ironman events have a 17 hour cut off – anyone due to finish after that gets pulled off the course. It was dark and had been raining, but the atmosphere at the finish was great, the commentators still enthusiastic and the cheerleaders dancing to europop (one thing I’ve learnt about triathlon events is that they love a bit of europop), and the final athlete looked extremely happy to see us/the finish line. That night it didn’t stop raining, my tent flooded and I was forced to abandon and dry out in the shower block, before throwing the tent in a skip and going to the airport – to find I’d left my penknife in my hand luggage, resulting in a thorough frisking. In Northern Ireland for the Giro d’Italia earlier this year, we’d wondered whether Yorkshire would match the enthusiasm seen in NI, with sheep painted, villages decorated, shops and restaurants with cycling themed menus and stock. I was sceptical of Yorkshire’s chances, having been hugely impressed by Northern Ireland (and of the opinion that NI felt it had more to prove). But Yorkshire caught the Tour de France bug, and soon sheep could be seen sporting fetching yellow fleeces, the Three mobile phone company had rebranded as “Trois” and there was bunting, bunting everywhere. I left everything late and didn’t book my train up to Leeds until the week of the tour, meaning I couldn’t book my bike on. This wasn’t a huge problem, as I was able to borrow my housemate’s 2-speed Brompton. He handed this over to me the day before I left, filthy, with no pedals and a puncture. I got it sorted and although I hated riding it at first, after a few minutes it felt less weird (although still twitchy) and I really got in to ringing the bell. Kings Cross was busy and I had to sit in the vestibule all the way to Leeds, although I was then lucky enough to get a lift to Harewood House, where we were camping. With help from Tanya, we pitched my tent (borrowed, after what happened in Austria) just before the rain started and enjoyed some beers in the campervan. 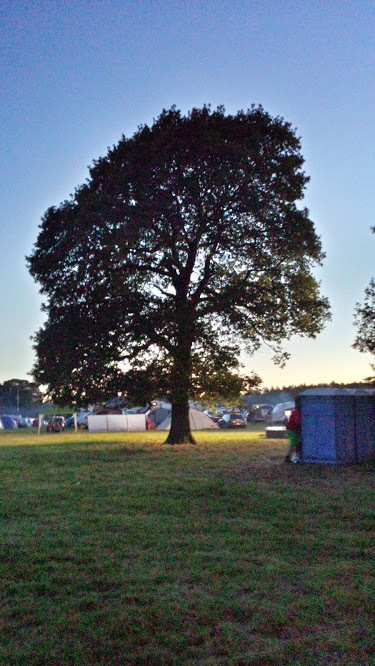 The morning of the Grand Depart, and the sun was out. 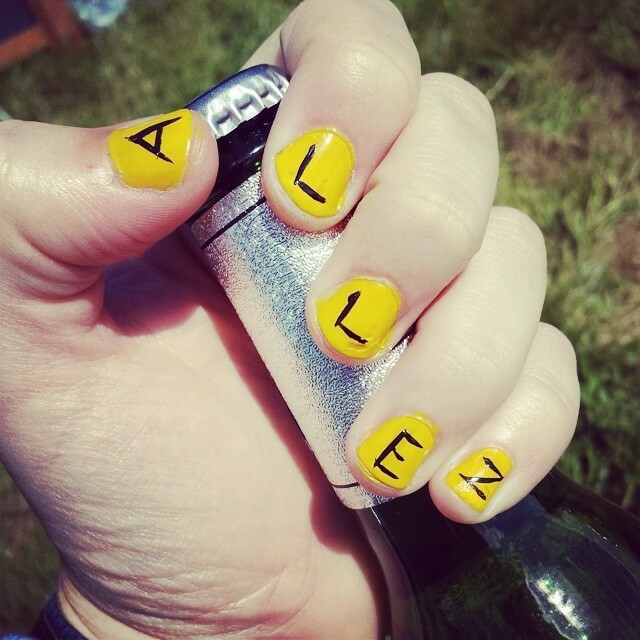 The riders were due to come through Harewood shortly after 11am, so that meant we could leave our tents at about 10.45, allowing me just enough time to paint my nails. I found a spot by the road and enjoyed the atmosphere in the crowd. A woman next to me handed me her three-month old baby. Isn’t Yorkshire friendly, I thought. I got a wave from Kate Middleton, as our lizard overlords drove past. I was then told that a friend was standing a bit further down the road so I went to join him and his family. General Lucifer is one of the nicest people I know, he’s witty and has the observational abilities of a hawk, but is also extremely good company and an all-out laugh to be around. It was a pleasure to watch the peloton go past with him and his family. Before the riders came past, there was a huge convoy of vehicles – official TdF vehicles, police cars, police bikes, French gendarmes, camera crew bikes. And that’s before you get to the team cars, the Mavic support cars and so on. Finally, the riders! The race was due to start properly at Harewood House (ceremonial Royal start and all that jazz) so they’d been rolling along and chatting. I really like seeing the riders having a good time, talking to the other riders, especially those who aren’t on their team. I guess these guys have spent years in each other’s company and might have known each other since they were kids. The race started and the Red Arrows flew over – something I’ve seen before but forget is quite so awe-inspiring. For the rest of the day I hung about at the campsite, watching the stage on the big screens set up around the main arena. I wasn’t feeling particularly well and was in a cycle of feeling too hot, shivering and falling asleep. By the end of the stage I was feeling quite hazy and it took several replays of the Mark Cavendish crash for me to figure out what had happened, with no chance of really figuring out why. I really felt for him, sobbing by the side of the road, before being put on his bike and limping over the line, holding his arm in such an obviously injured way (get well soon, Cav!). We spent another night at the campsite, barbecuing asparagus and talking too much shop. The following day I felt a bit better, although I’d not slept well (freezing cold, and imagining that it was raining when it wasn’t). Tanya and I decided that we needed to use our bikes, having dragged them up to Yorkshire, so we decided to head for Harrogate, where Stage 1 had finished and where Stage 2 would be passing through again (Harrogate *is* very nice, who can blame the organisers?). Tanya was on her heavy touring bike and I was on the Brompton. Immediately leaving Harewood House is a large descent, which was fun until I realised how twitchy the bike felt and OHMYGODTHISISABROMPTON. There are also a few ascents on the way to Harrogate, all of which I managed on the “hill climbing gear” on the Brompton, stamping on the flat pedals and trying to spin as fast as I could before I could lose momentum. This happened on the final hill, as I ran out of steam and had to push the silly-wheeled bike up to the top. We didn’t really know where we were going in Harrogate, so just kept going until we found the Tour route, at the north of the town. There was already quite a crowd, all in good moods. As the motorcade started coming through we laughed at the police high-fiving the crowds, sirens and horns blaring. We could see the coverage helicopter overhead so knew the riders would be through soon, and an official vehicle came through announcing that the first riders we’d see would be the breakaway, with the peloton following shortly after. The breakaway came through – no idea who they were! The team cars made it a bit clearer, but at the speed the riders were going you could barely count how many there were, let alone who they were. When the peloton came past I held my phone up and took a few snaps, nothing fantastic but nice to have a memento. I even snapped Chris Froome, looking far better than he did a few days later in France (get well soon, Chris!). 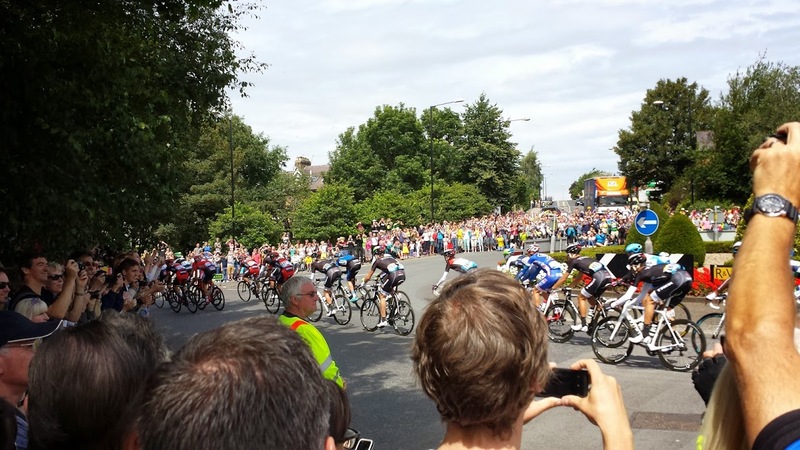 With the riders passed, we waved at some team cars before nipping back into Harrogate and beating the crowds to Betty’s Tea Rooms. We had some tea and soup, then bought a chocolate bar each and had a quick nap in the park before tackling our return to Harewood. The return to Harewood wasn’t as bad as I thought it might be. The final climb saw a lot of traffic on the road as well as a cycle sportive, but I followed a roadie up, using the gaps he made in the traffic to squeeze my tiny wheels through. A lot of the sportive riders looked put out to be passed by a Brompton, and the roadie turned to me when we reached the top and was probably going to congratulate me on sticking with him when he realised a) I was a girl and b) I was on an impractical bike. Back at Harewood, we watched the rest of the race on the big screens, eating chips, before heading back to London and its angry car drivers. With all the action in this Tour, I’m glad I got to see some of it and be part of the Tour experience – and by seeing the race right at the very start I was able to see it before anyone had crashed out. As I write, Cavendish, Froome, Contador and 15 others have abandoned the race, and we’re only at the first rest day. It’s been very exciting, for cycling and for Yorkshire, and I hope all the injured riders heal up fast. Final thought: Froome tries to carry on riding with two broken hands, Contador climbs a Cat 1 mountain with a broken leg – and people still think football, with its pantomime diving and theatricals, is a real sport?